The different systems of parsing frame the ways in which Japanese prefectures are perceived. Okinawa Prefecture is traditionally parsed as part of the Kyūshū region of Japan. Okinawa Prefecture is made up of islands which are southwest of the island of Kyushu. The Japanese government recognize the prefecture as its own region in evolving 9-region, 11-region and 13-region systems. The default alphabetic order in this sortable table can be altered to mirror the traditional Japanese regions and ISO parsing. ↑ 1.0 1.1 Web-Japan.org, "Local self-government," p. 1; retrieved 2012-12-19. ↑ 2.0 2.1 Nussbaum, Louis-Frédéric. (2002). 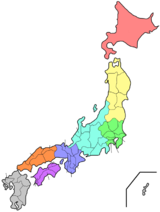 "Provinces and prefectures" in Japan encyclopedia, p. 780. ↑ 4.0 4.1 Tokyo Prefecture means Tokyo-fu (東京府, 1869-1943); and Tokyo, Tokyo means City of Tokyo (東京市, Tōkyō-shi, 1869-1943). Tokyo means the Tokyo Metropolis (東京都, Tōkyō-to, 1943-present). ↑ Kanno, Eiji. (1998). New Japan Solo, p. 397; excerpt, "Administratively, Okinawa is part of Kyushu Region, even though it is l .000 km (625 miles) southwest of Kagoshima." ↑ Nussbaum, Louis-Frédéric. (2005). "Okinawa-ken" in Japan Encyclopedia, pp. 746-747. ↑ Hook, Glenn D. (2011). Decoding Boundaries in Contemporary Japan: The Koizumi Administration and Beyond, pp. 145-146. This page was last changed on 29 August 2018, at 05:43.